While sufficient sleep is vital to overall health and wellness, deep sleep is essential for storing memories. But as people age, their amount of deep sleep decreases. 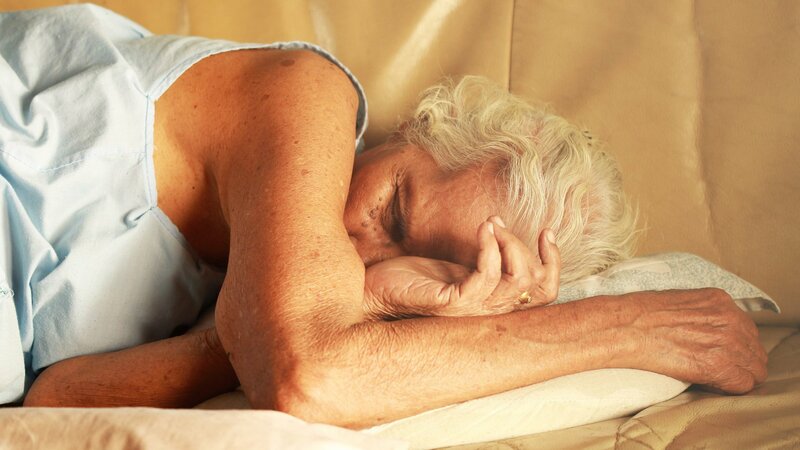 Research has shown an association between lower amounts of deep sleep, or slow wave sleep, in people with impaired cognition, such as dementia or Alzheimer’s disease, said Dr. Phyllis Zee, a professor of neurology at Northwestern University Feinberg School of Medicine. During slow wave sleep, brain waves become very slow to about one per second compared to 10 oscillations per second during wakefulness. “It’s associated with the deepest stage of sleep and thought to be the most restorative stage of sleep,” Zee said. Playing pink noise – described as a waterfall-like sound – in sync with a person’s brain waves was found to enhance deep sleep and sleep-dependent memory retention in older adults, according to a newly released Northwestern study. In the video clip below, hear what pink noise sounds like. Since past studies have focused on younger adults (who by default get more deep sleep than their elders), it was unknown whether acoustic stimulation would have an effect on adults ages 60 and up, according to Zee. “What’s innovative and new ... is we’re able to take an individual with lower amounts of slow wave sleep and increase the slow wave activity through acoustic stimulation and that the stimulation can have beneficial effects on memory with older people,” she said. In the study, 13 cognitively healthy adults between the ages of 60 and 84 received one night of acoustic stimulation and one night of what researchers called “sham stimulation” in which no sounds were delivered but all other conditions were the same. Each night, about 90 minutes before bedtime, participants completed a task involving word pairs, in which they were told to memorize moderately associated word pairs, such as energy-oil, that appeared on a computer screen. Immediately after seeing each word pair, participants were asked to recall as many as they could when presented with the first word of each pair in a random order. Correct word pairs were displayed on a computer screen after attempted recall. Nelly Papalambros, who is the first author of the study and neuroscience student at Northwestern, is pictured wearing a commercially available headband with wireless earphones used to deliver sound to sleeping participants. (Northwestern University) As participants slept, their brain waves were tracked in real time. This allowed researchers to begin acoustic stimulation at a very specific moment during slow wave activity that researchers determined is most effective for memory enhancement, according to Zee. Northwestern scientists developed an algorithm to deliver the pink noise at critical times during deep sleep. Sounds were delivered to participants via soft headphones specifically designed for sleep at a low enough level that would not arouse them from sleep. Participants who received acoustic stimulation remembered three times as many words in the morning than they did the night before, according to the study. Word recall in the morning also increased in the sham stimulation – but to a much lesser degree. “We already know that sleep has beneficial effects, but [acoustic] stimulation had an additional benefit over just regular sleep,” Zee said. “Overall, I think the applications are huge, but especially in an older age group specifically related to memory. While the implications of the findings are “exciting,” Zee acknowledges the study had several limitations, including small sample size. Future studies should also examine whether or not acoustic stimulation affects visual or motor memory as well, Zee said. Feb. 16: Women perform better than men on memory tests used to diagnose Alzheimer’s disease, according to a recent study. But could this mental advantage be masking early markers of the disease in women? April 28, 2016: She's the co-founder and editor-in-chief of The Huffington Post and a syndicated columnist. Arianna Huffington talks about the wake-up call that led her to write her 15th book, "The Sleep Revolution." March 7, 2016: “People need to think of adequate sleep as an important aspect of maintaining good health," said Erin Hanlon, Ph.D., lead author of a new University of Chicago study linking insufficient sleep with increased consumption of snacks and high-energy, high-fat foods.